Piggy Tail has always piqued my interested with its cute sign & busy crowd whenever I walk pass it. Piggy Tail seems to be a rather popular after-work hang out spot for working adults to have their dinner & drink. I was rather elated when I was given the chance to try out this place! 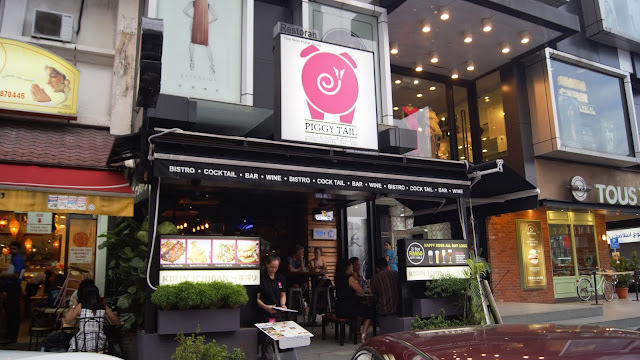 Piggy Tail is located along the busy street of Jalan Telawi 3, facing Bangsar Village II & located just next to Nirwana. 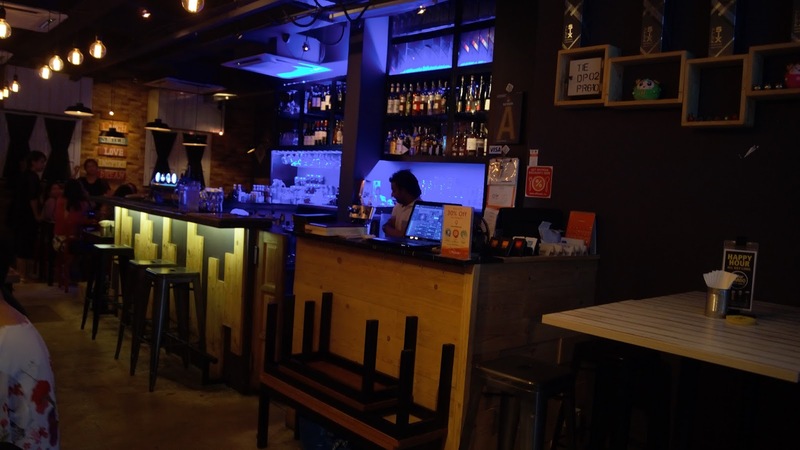 Diners can choose to dine in at the el fresco area overlooking the busy streets of Bangsar Telawi or the indoor seating area. Lights are dimmed after 9.30pm to give the place more "bar vibes". I love the fact that the music here is not too loud despite having a bar scene- it gives us diners a nice "bar vibes", yet our conversation does not get drowned down by the loud music. 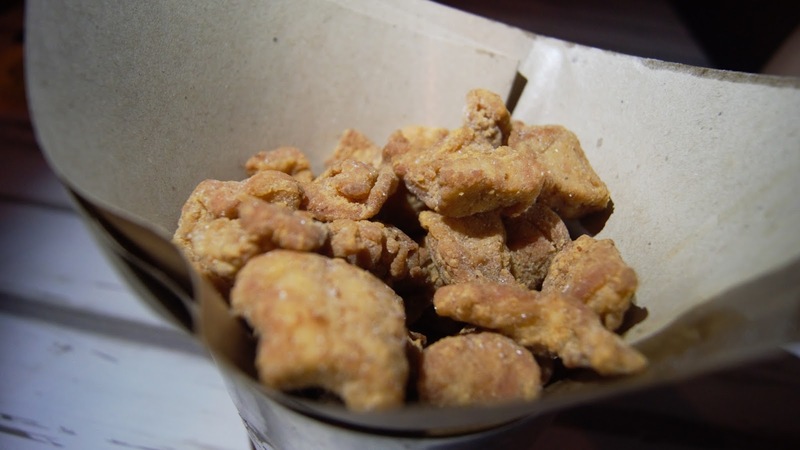 Deep Fried bite-sized Sakura Pork Cutlet with the right proportion of fats & lean meat, coated with a thin & crunchy layer of golden-crisp batter seasoned perfectly with spice & herbs. A perfect beer food and also good with a glass of wine. Warning, super addictive! Once I popped one into my mouth I couldn't help but to reach out for an extra helping. Blend of three different mushroom, cooked with truffle oil and cream. 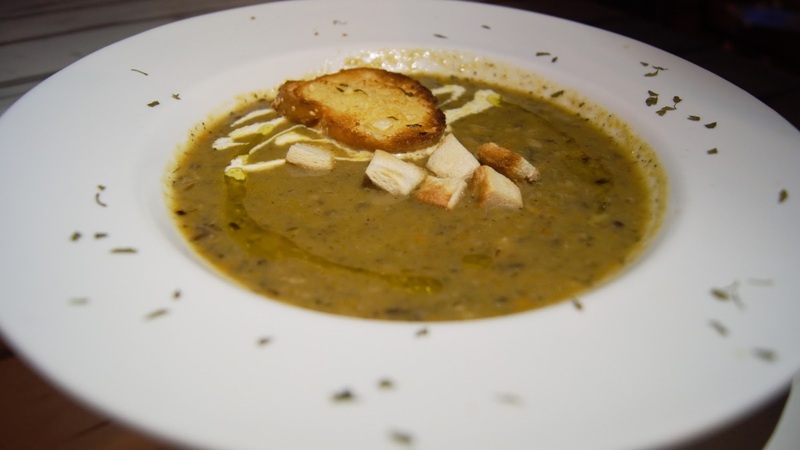 Creamy & flavourful, I loved this soup to bits! The addition of truffle oil certainly gave this dish an extra punch. Spaghetti cooked with Olive Oil, Garlic, Chili Flakes & topped generously with succulent Sakura Pork Neck meat & Sliced Bacon. 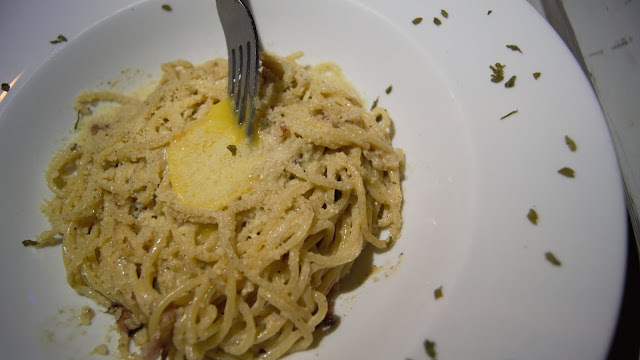 The Carbonara served here at Piggy Tail is close to the original Carbonara, topped with a runny egg yolk and sprinkled generously with cheese. A creamy dish which is better off sharing, as it might be overly cloying for some to finish on its own. 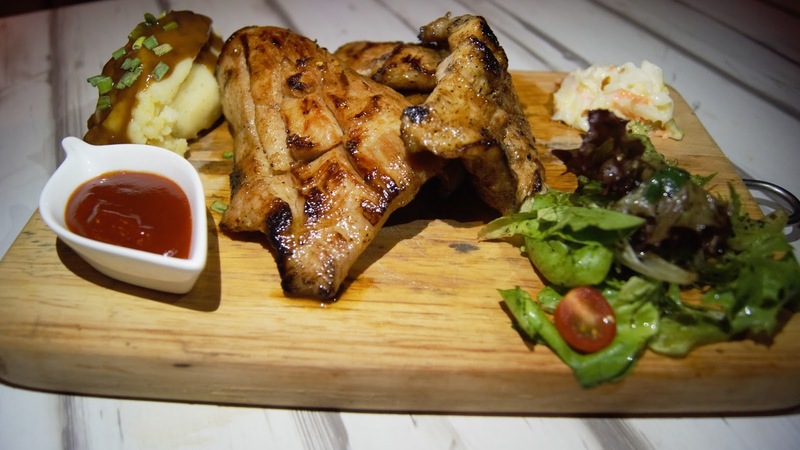 Premium Pork Shoulder grilled & marinated to perfection. Served with Unique Piggy BBQ sauce, Mashed Potatoes, Coleslaw & Greens on the side. The pork shoulders were tender & juicy. Tasted good on its own even without dipping into the sauce on the side! 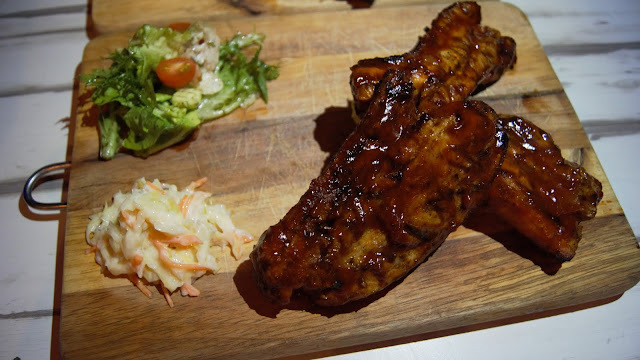 Ribs marintaed with housemade BBQ sauce, grilled to perfection. Served with a side of Greens and Coleslaw. The BBQ Pork Long Ribs didn't quite hit the spot for me. Personally felt that the long ribs were a little dry and tough. 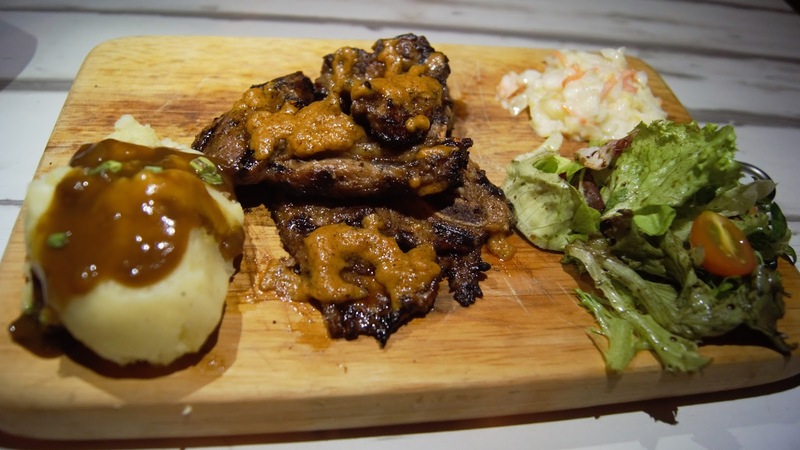 Another personal favourite of mine would definitely be this Signature Lamb Chop. The lamb meat were tender and succulent, with the sides slightly charred to give it a smoky BBQ taste in addition to its flavourful Homemade Mongolian sauce. A perfect platter for sharing. 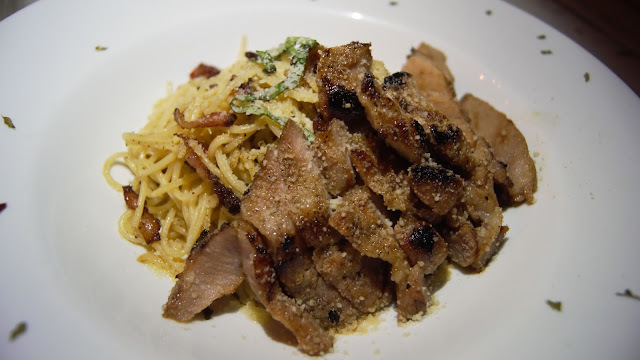 Crunchy crackling skin, encasing the juicy tender meat inside. Served with Coleslaw, Greens & Supreme Gravy. 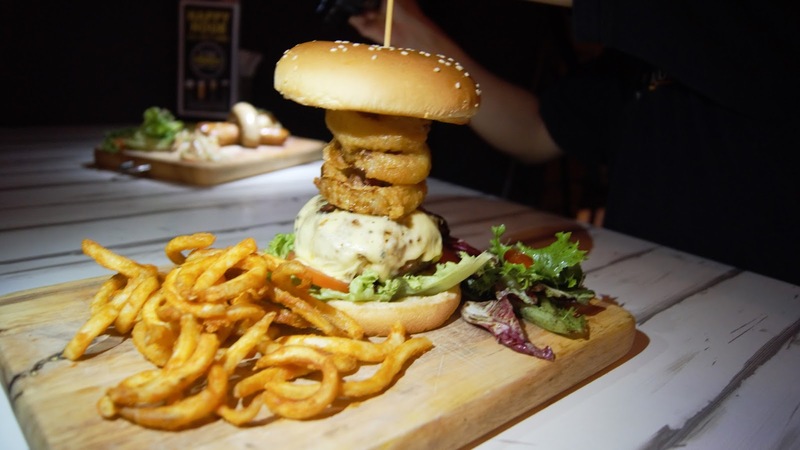 Burger Bun sandwiching a thick yet juicy Pork Patty drenched in Cheese, fried Onion Rings and fresh greens. Served with a side of greens & addictive curly fries. I challenge you to try to fit this burger into your mouth without dissembling it! I love how the contrast between textures of the juicy pork patty and the crunchy fried onion ring goes so well together. 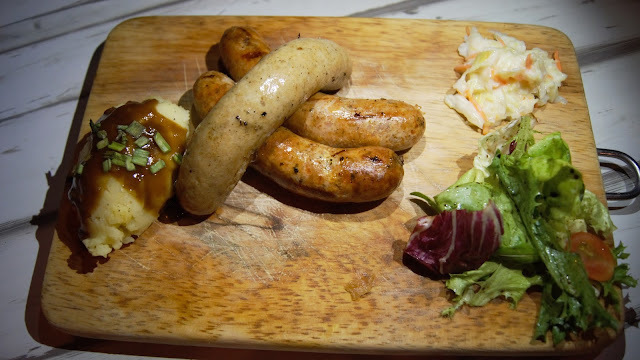 Three different Pork Frankfrutters (Herbs, Spicy & Original) served with mashed and greens. We ended our meal with a sweet note. Homemade Truffle ice-cream topped with Bacon Bits & drizzled with chocolate sauce. 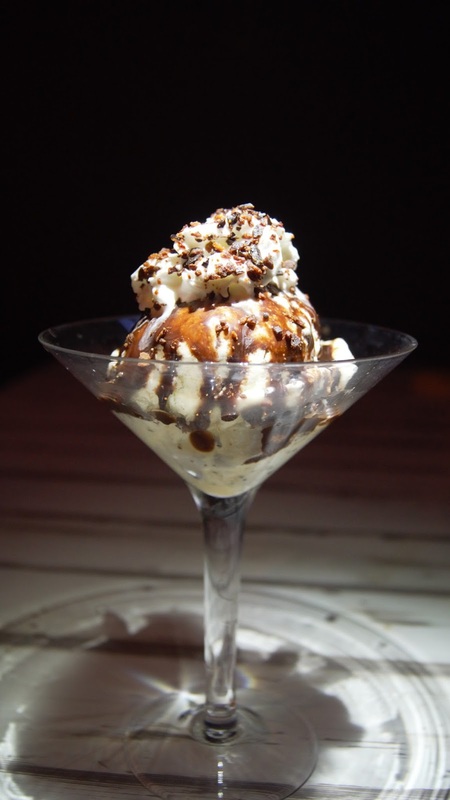 A unique combination of sweet & savoury all in one dessert. 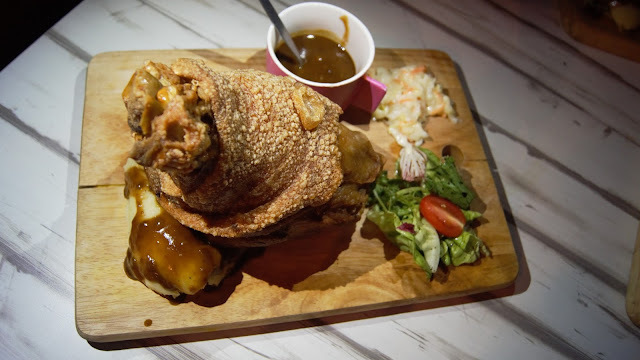 If you're looking for a nice place for a filling & satisfying dinner accompanied with a drink, Piggy Tail would be the place to be!